I measured a selection of these pants and found the waist size of the pants to measure out consistently at 2” larger than the stated size. Most men’s jeans will be sized this way these days… it’s called vanity sizing, so most people can just choose the size they wear in jeans. To double check the sizing selection, I recommend you measure your waist or the waistband of your favorite jeans to see what size pants you need. The waist sizes for each pant size can be adjusted down by 2 to 3 inches with the side waist adjusters. Inseam on the regular size pants is about 33” which works for most people. Here is a chart I put together to show you how each pant size measures out so you can select the size based upon what you come up with when you measure yourself. Dakar pants are a classic off-road design, but they cross over the adventure or street as well. For street, you can add armor to the hips and knees. The body of these pants is made of rugged nylon textile material. The lower legs and hips have heavier materials and the other, less impact prone areas are lighter and more flexible. Like other off-road and adventure designs, the inside area of the pant legs are made of leather. The leather helps you grip the bike and also work better than nylon should you touch a hot pipe. And from a wear and tear perspective, the leather helps the pants last longer. The lower legs are wide to work over off-road or adventure boots. They have long Velcro strips so you can adjust how they fit to work with your boots. The material (besides the leather) used at the ends of the legs is very sturdy because the pant leg ends will see a lot of wear and tear. These pants have long zippers on the upper thigh area for venting. These zips are sort of diagonal across each thigh facing forward, so they should catch tons of air when open. Also, the legs are larger in diameter to accommodate off-road/adventure boots and so there is plenty of room for air to travel down the legs too. Alongside those zip vents on each thigh are a couple zip-close pockets for storage too. The storage pockets are made like cargo pockets so they’ll hold a decent amount of stuff. 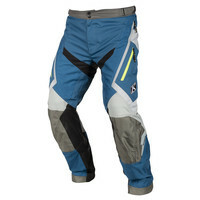 If you are an off-road rider, you may have your own armor equipment for knees, so these pants don’t come with armor as standard, but they do have pockets for the installation of armor if you want it. Adventure riders and dual sport riders may not have external armor rigs, so you can choose the D3O armor for knees and hips (see the links below). Either CE level one or two are available. These pants are lighter materials, so I’d suggest the level 1 inserts. Klim says: Klim’s most popular off-road pant chassis is better than ever with a more streamlined fit, printed fabrics, unmatched durability, cargo capacity, comfort, and the best-controlled ventilation system ever designed. This all-season off-road pant is just at home conquering Dakar Rally stages as it is roosting your buddies on an all-day local ride.